Over the past decade, more than a third of all newspapers have changed ownership. The seven largest investment companies have been the most aggressive purchasers and often reshuffle their portfolios to maximize financial performance. As a result, they are continually buying, selling, and closing newspapers. The following timelines explains how each of these seven companies grew. This list, which includes major acquisitions, sales and closures is based both on analysis of the UNC database and on press accounts of the transactions. In 2005, Fortress Investment Group (FIG) purchased the Liberty Publishing Group and renamed the company GateHouse. In 2013, the newspaper assets were transferred to a new holding company, New Media Investments. 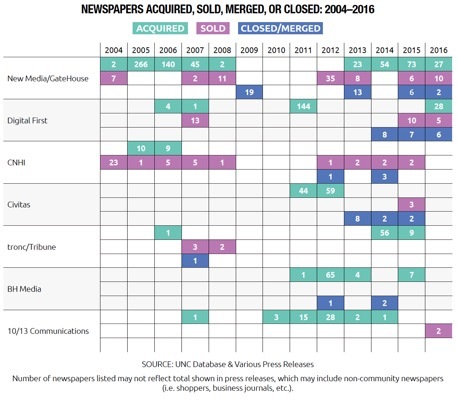 New Media/GateHouse has been the most active investment company in terms of acquiring, selling and closing or merging newspapers. 1998 o Liberty Group Publishing founded when former Hollinger attorney Kenneth L. Serota acquired the newspapers Hollinger was selling via the backing of Leonard Green & Partners. + Acquired newspapers in Kansas, Louisiana, Idaho, North Dakota and Illinois. + Acquired Life Printing & Publishing Co.
2000 + Acquired three dailies in Southern Michigan. 2004 - Sold two dailies (South Idaho Press and Elko Daily Free Press) and five weeklies to Lee in exchange for two dailies. 2005 + Fortress Investment Group (parent of New Media/GateHouse) acquires Liberty Group Publishing and renames it GateHouse Media. 2006 + Acquired 13 Massachusetts newspapers from Enterprise NewsMedia. + Large acquisition, predominately in Massachusetts, from Community Newspaper Co. (Herald Media). + Acquired newspapers from New West in Nebraska and West Virginia. o Gatehouse has successful IPO. Fortress owned 60% of shares. 2007 - Sold the weekly Clintonville (Wisconsin) Tribune-Gazette. + Acquired 11 newspapers in Rochester, New York. + Acquired five newspapers in Massachusetts from Journal Register Company. o Acquired telephone directory business from SureWest Communications. + Acquired seven newspapers in Illinois and Ohio from Copley Press. + Acquired four newspapers in Illinois, West Virginia, New York, Connecticut from Gannett. - Sold the Huntington Herald-Dispatch to Marshall Reynolds of Champion Industries. + Acquired Aurora (Montana) Advertiser from Sumners. + Acquired two newspapers from Morris Publishing Group. 2008 - Sold one of the Morris Publishing Group newspapers to Yankton Media. - Sold one of the Morris Publishing Group newspapers to the New York Times. o Gatehouse Media delisted from New York Stock Exchange. + Acquired Dover Post and related publications in central Delaware. - Sold three newspapers to Sample News Group. + Acquired Pennysaver Group in New York. - Sold two dailies to Omaha World-Herald Co.
- Sold two weeklies (Arizona Silver Belt and San Carlos Apache Moccasin) to News Media Corp.
- Sold three newspapers to Randy Miller. 2009 - Closed three dailies (Kansas City Kansan, Derby Reporter, Edinburg Daily Review) and 16 weeklies. 2012 - Sold Suburban Chicago group (35 papers) to Shaw. 2013 + Acquired two newspapers from Dow Jones Local Media Group. o Gatehouse filed for bankruptcy after an agreement had been reached with creditors to merge Newcastle with Gatehouse post-bankruptcy. Fortress owned 52% of Gatehouse debt at the time of bankruptcy and following merger. o After the restructuring, Newcastle/GateHouse came under the newly-formed holding company New Media Investments. This also included the Local Media Group of newspapers. - Closed newspapers in New York. - Closed eight weeklies in Boston area. - Closed one weekly and four dailies in Massachusetts. 2014 o Under a new name, New Media Investment Group goes public. + Acquired newspapers from Freedom Communications. + Acquired American Consolidated Media's remaining papers. + Acquired the Petersburg (Virginia) Progress-Index from Times-Shamrock Communications. + Acquired Providence (Rhode Island) Journal from AH Belo. + Acquired Halifax Media Group. 2015 + Acquired 73 newspapers from Stephens Media. - Sold Las Vegas Review-Journal, which had been acquired from Stephens, and five weeklies to Sheldon Adelson. - Closed weekly Jonesville Independent. o Acquired Dolan Company, owner of business newspapers. - Closed dailies Murphysboro American and Daily American in Illinois. 2016 o Acquired Journal Multimedia, "a multi-title publishing, events, media and data company." + Acquired family-owned Erie Times-News. + Acquired Dispatch Printing Company in Ohio. + Acquired family-owned Fayetteville Observer. - Closed weeklies Cambridge Chronicle and Summerville Journal. - Sold four dailies and six weeklies in Southern Illinois. Alden Global Capital, founded Digital First Media in 2011 as a subsidiary that included newspapers from MediaNews Group and Journal Register Co.
2006 + Acquired four of the 12 Knight Ridder papers that McClatchy wanted to sell after it bought Knight Ridder. 2007 + Acquired Santa Cruz Sentinel from CNHI. 2013 o MediaNews Group and 21st Century Media combination finalized. The two companies merged into Digital First Media. 2007 - Sold Rhode Island newspapers to RISN Operations. - Sold Massachusetts newspapers to New Media/GateHouse. 2012 o Journal Register files for bankruptcy, allowing Digital First Media to acquire it. 2011 o Digital First Media is founded as a holding company. + Acquired 144 newspapers from MediaNews Group, which had been in bankruptcy. 2012 o Seeks potential buyers of interest in Colorado Rockies baseball team. 2014 - Consolidated eight weeklies into one regional weekly. o Announced that it's looking to sell "the Company as whole, the sale of one or more regional clusters, or the continued execution of its business plan." No sale was completed. 2015 - Closed a regional newspaper, which had been a merger of eight Digital First newspapers. - Gannett acquired full ownership of ten newspapers that were previously jointly-owned with Digital First Media. - Closed Washtenaw Now (which had absorbed five papers). 2016 - Merged six dailies into two new publications: East Bay Times and Mercury News. - Sold Salt Lake Tribune to Jon Huntsman. + Acquired OC Register and other newspapers from Freedom Communications. - Sold three New England dailies (Bennington Banner, Berkshire Eagle, Brattleboro Reformer) and a weekly to Birdland Acquisition. CNHI was created in 1997 as a holding company for the Retirement Systems of Alabama to purchase newspapers. 1997 + Retirement Systems of Alabama formed CNHI in 1997 with the purchase of 14 papers from Media General. 1999 + Acquired 28 newspapers from Hollinger. 2000 + Acquired 17 newspapers from Thomson. 2002 + Acquired a number of newspapers from Dow Jones Ottoway. 2005 + Acquired 10 newspapers from Eagle-Tribune Publishing Co.
- Sold newspaper to former publisher, Michael Sample. + Acquired newspapers from Dow Jones Ottaway. + Acquired newspaper from Gannett Foundation. + Traded two dailies and one weekly with Triple Crown Media for one larger daily. 2007 - Sold two dailies to MediaNews Group. - Sold Sapulpa Daily Herald, Coffeyville (Kansas) Journal (weekly), and the Cushing Daily Citizen to Sumner Newspapers. 2008 - Sold Texas newspaper to local publisher, Jim Moser. 2012 - Sold additional Texas newspaper to Jim Moser. - Closed Laurel (Mississippi) Leader-Call. 2013 - Sold daily (Picayune Item) and weekly (Poplarville Democrat) to Boone Newspapers. 2014 - Closed Daily Southerner of Tarboro (North Carolina). - Closed Medina Journal-Register (New York). - Closed Tonawanda News (New York). - Sold daily (The Port Arthur News) and weekly (the Orange Leader) to Boone Newspapers. 2015 - Sold two newspapers to Boone Newspapers. Versa Capital Management formed Civitas Media in 2012 when it combined four media subsidiaries the company had bought in bankruptcy or financial distress. Those four were Freedom Central, a division of Freedom Communications; Heartland Publications; Impressions Media; and Ohio Community Media (Brown Publishing). 2011 + Acquired all of Ohio Community Media, which was formerly Brown Publishing Company. + Acquired 4 newspapers from Freedom Communications. + Acquired newspapers from Impressions Media. + Acquired newspapers from Heartland Publications. o Versa Capital Management formed Civitas Media in 2012 when it combined its four media subsidiaries: Freedom Central, Heartland Publications, Impressions Media, and Ohio Community Media. 2013 - Closed five newspapers in North Carolina and three in Ohio. 2015 - Closed two newspapers in Ohio. 2016 - Sold three newspapers to Clermont Sun Publishing. - Closed two newspapers in Ohio. In 2007, the Tribune Co., which included radio and television stations, as well newspapers, was purchased for $8.2 billion by investor Sam Zell. Since 2014, when the newspaper division was spun off from the broadcast holdings, Tribune Publishing, recently renamed tronc, has made several purchases, including the Sun-Times’ suburban weeklies. Pre-2006 o Tribune Company had been a publicly traded company until its decline in the mid-2000s. It owned a number of major U.S. dailies, including the Chicago Tribune, LA Times, and Baltimore Sun. 2006 + Acquired the rest of AM New York, giving it full ownership of the paper. 2007 o Sam Zell purchases the company for $8.2 billion in a highly debt-leveraged deal and takes Tribune private. - Sold dailies Stamford Advocate and Greenwich Time to Hearst/MediaNews. - Sold the alternative Valley Advocate in Connecticut to Newspapers of New England. - Closed daily Spanish language newspaper, Hoy New York. 2008 - Sold both Newsday and AM New York to Cablevision Systems Corporation to offset the debt created by Zell. 2009 o Sold Chicago Cubs and Wrigley Field for $800 million. 2012 o Emerges from bankruptcy under the ownership of creditors JPMorgan, Oaktree and Angelo, and Gordon & Co.
2013 o Tribune then increases its TV division by buying Local TV Holdings LLC 19 TV stations. 2014 o Tribune Publishing officially spins off from the broadcasting division as a publicly traded company. + Acquired Sun-Times Media's 38 suburban properties from Wrapports. + Acquired alternative weekly Baltimore City Paper. + Acquired the Annapolis (Maryland) Capital Gazette and Carroll County (Maryland) Times from Landmark Media Enterprises. + Acquired 15 weekly papers from the ReminderNews Group. 2015 + Acquired San Diego Union-Tribune and its associated newspapers. 2016 o Tribune Media seeks new owner. o Michael Ferro became the largest shareholder of the company after donating his shares of the competing Chicago Sun-Times to a newly-created foundation. o Won a bid for OC Register and Riverside Press-Enterprise, beating Digital First's bid, but were blocked from ownership by the Justice Department based on monopoly concerns. o Gannett made several bids for the company, but Ferro refused to sell. The second-largest shareholder, Oaktree Capital, has pushed for a sale. o Tribune rebrands itself as tronc, an acronym for Tribune Online Content. o The future ownership of the company remains in question as Gannett is still interested in a takeover. BH Media was formed as a newspaper subsidiary in 2011 after Berkshire Hathaway purchased the Omaha World-Herald in Warren Buffett’s Nebraska hometown. In 2012, BH Media grew significantly when it bought Media General’s newspapers. Since then, the company has continued to grow through smaller acquisitions. Pre-2011 o Prior to forming BH Media, Berkshire Hathaway owned the Buffalo News and was the largest shareholder of the Washington Post Company. 2011 + Acquired the Omaha World-Herald and created BH Media. 2012 + Acquired all of Media General except Tampa Tribune and its related publications. + Acquired two Texas dailies. - Closed one daily, News and Messenger. 2013 + Acquired family-owned Press of Atlantic City. + Acquired Virginia and North Carolina newspapers from Landmark Media Enterprises. + Acquired family-owned Tulsa World (Oklahoma). 2014 - Closed two weeklies. 2015 + Acquired family-owned Martinsville Bulletin (Virginia). + Acquired five newspapers from Community Publishers Inc in Tulsa, Oklahoma. + Acquired Fredericksburg Free Lance-Star (Virginia). This private investment firm, formed in 2010, is a partnership between 10K Investments and 13th Street Media. Since its formation, 10/13 Communications has made three major acquisitions: Freedom Communications’ Phoenix assets, the Dallas operations of American Community Newspapers, and ASP Westward’s Houston newspapers. The company also bought the ITZ Group, a digital consulting company, in 2013. 2007 + 13th Street Media, not yet merged with 10k Investments, acquires Explorer of Tucson, Arizona. 2009 o 10/13 Communications created in August 2009 when 10k Investments (owned by Arne Hoel and Brett Coleman) and 13th Street Media (owned by Randy Miller) merged together into one company. 2010 + Acquired Freedom Communication’s Phoenix assets. 2011 + Acquired Dallas operations of American Community Newspapers (aka Star Community Newspapers). 2012 + Acquired ASP Westward’s 28 Houston newspapers. 2013 o Acquired ITZ group, a digital publishing company. + Acquired Lake Cities Sun & Argyle Sun (Texas). 2014 + Acquired three monthlies from Tucson West Publishing and increased one to a weekly. 2016 - Sold one daily and one weekly to Times Media Group.